Mexican foundry Tisamatic has benefitted from a significant reduction in downtime at its new facility in San Luis Potosi after upgrading one of the company’s existing blast machines with new Wheelabrator components. A subsidiary of the Grupo Industrial Saltillio (GIS) conglomerate, Tisamatic produces precision grey and ductile iron castings for the automotive industry, including engine blocks and parts for drivetrains, brakes and chassis systems. The company opened a second foundry in San Luis Potosi in the summer of 2014 following a $65m investment. Tisamatic has three identical tumblast machines from Wheelabrator, which are crucial to the operation and used mainly to clean driveshafts and brake discs. An ambition to ramp up production prompted Tisamatic to contact Wheelabrator to analyse the performance of one of the three machines and ensure blast operations would cope with increased output targets. The 30-year-old machine’s performance had dipped, with high abrasive consumption and large amounts of sand in the operating mix causing high wear and, consequently, a lot of unplanned downtime. The Wheelabrator team recommended an Equipment Modernisation Programme (EMP) to address these issues and improve the machine’s productivity. 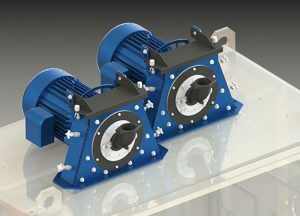 An assessment showed that upgrading the two blast wheels to a dual 50HP EZEFIT wheel arrangement and installing new magnetic separators would bring significant benefits. A new, larger upper screw conveyor and rotary screen were also installed to improve the condition of the abrasive mix. Since the upgrade, maintenance time has been successfully reduced, with machine availability up by 60%. Furthermore, cycle time has been cut by almost a fifth, creating headroom in production capacity for Tisamatic. In response to strong and sustained growth, Industrial Washing Machines (IWM) has recently expanded its production facilities by a 10,500 sq ft. This represents an increase of around 40%, with space at IWM now totalling over 35,000 sq ft. The development will enable IWM to further enhance its design and manufacturing services for customers in all areas of manufacturing. With its headquarters in Kings Norton, Birmingham, the additional space is also making it possible for IWM to accommodate its expanding workforce. The company has already recruited six additional people this year, including skilled shop-floor workers, service engineers and design engineers, and is looking to employ further specialists in the near future. The first benefits of IWM’s expansion are already becoming apparent. To complement its existing range of washing and sanitising equipment, IWM has now launched a new range of hygiene products including stainless boot-washing machines suitable for a variety of industry sectors and applications that require high levels of hygiene and efficiency. 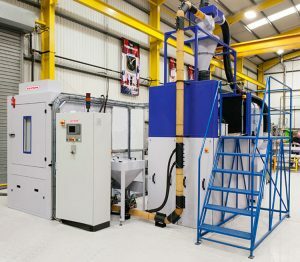 Finishing equipment manufacturer Guyson International has designed, built and installed a twin pressure pot, Guyson RB10 PF robotically-controlled blasting system at a manufacturer of high-performance coatings. The system serves the dual application of keying the surface of aerospace seal rings prior to plasma spraying, and the surface preparation of turbine blade tips prior to thermal-spray coating. In operation, a 5 mm boron-carbide blast nozzle is robotically manipulated at the fixtured component. The robotic manipulation of the blast nozzle maintains the optimum surface speed, blasting angle and exact offset distance from blast nozzle to part – be that either the aerospace seal rings or the turbine blade tips. Robotic positioning of the blast nozzle is performed by an ABB foundry plus robot system, located to the rear of the cabinet and encased within a safety enclosure fitted with fortress type interlocks that provide access for maintenance or adjustment purposes, yet ensure no one can enter the space during operation. A small 7th-axis turntable is fitted in the middle of the blast chamber and is designed to accommodate the customer’s varied fixtures, due to the multiple uses of the cabinet. The robot fixture holds two blast nozzles – each with a separate blast-media supply. However, only one appropriate nozzle linked to each of the applications is active at any one time. 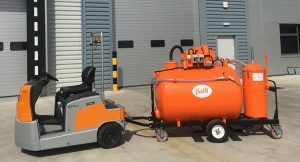 Blasting is achieved via either of the two Guyson Model G55 pressure pots (55 litres each). These are used to generate the blast stream within the blast chamber, with media being fed from the appropriate pressure vessel into the cabinet through heavy-duty hose to the blast nozzle. Freddy Products, which has sold more than 15,000 industrial vacuums over its history, is now on the lookout for machines in need of a refurb. Established in 1962, Freddy Products has been manufacturing and selling its coolant and swarf vacuums, centrifuges and tramp oil separators globally for over half a century. In some instances, a Freddy vacuum may only need a clean-up, new hoses and a few new switches. However, Freddy can undertake integrity and leak testing, and the subsequent replacement or repair of the sumps and tanks. The company can also replace electronics, pumps, hoses, seals, castors, motors, gaskets and anything else that may appear beyond repair. In addition, it can customise old Freddy units to modern day needs. In some cases, customers have requested fork-lift channels and even tow bars to improve the mobility of large Freddy systems. “The Freddy range has been built to last and we are often seeing old Freddy systems from the 1960s and 70s that are sat in the corner of a factory due to a simple fault or maintenance issue that can easily be rectified,” says Hanmer. 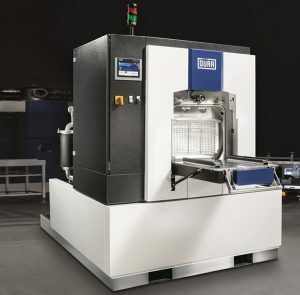 For those seeking an entry-level machine capable of facilitating aqueous parts cleaning, Dürr Ecoclean can now offer its EcoCCube. The small footprint (2100 x 1630 x 1855 mm) and low weight, as well as the complete equipment and ready-to-connect construction, enable fast and easy integration of the user-friendly front-loading system into production. Parts soiled with oil and/or emulsion can be cleaned individually or as bulk components. The all-round spray system with four nozzle sets works with a high circulation flow rate, both when cleaning and during rinsing. Furthermore, the cleaning effect of the medium used can be increased through the rotation of parts in the work chamber. Parts drying is performed by hot air circulation without loss of vapour to the environment. The EcoCCube’s programmable control system allows for storing 10 programs, while an intuitive HMI control panel makes the selection and start of the program in question easy and safe, thus contributing to process reliability. 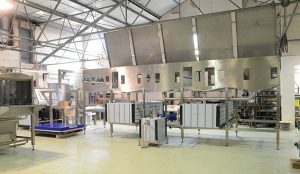 Cleaning, rinsing and drying operations enable up to 12 batches, each with a maximum weight of 80 kg, to be cleaned per hour. Contaminants brought into the bath are continuously removed from the fluids by an integrated full-stream filtration system and oil skimmer. Therefore, long bath service life is achieved. Moreover, the system attains its operating temperature quickly and efficiently due to the optimised dimensions of two standard flood tanks.